CI Destinations along with Los Osos/Baywood Park Chamber of Commerce will be offering a fully escorted tour of Ireland on October 15, 2019. Ireland has much to offer everyone. From storybook castles to magnificent gardens, wide open spaces to the bustle of international cities, breathtaking natural scenery to man made megalithic structures, Ireland opens her arms and welcomes you to explore her ancient sites, traverse her green fields and discover her treasures. The scenery is gorgeous, the weather is mild (though changeable), there is a rich cultural heritage to discover, and a wealth of music and stories to share. Visit https://highway1discoveryroute.com/cdc to see a list of all activities and learn more about the award winning Stewardship Travel Program. Join us for a Celebration of Accomplishments, Installation of Board Officers and Directors on Friday, January 18th at 6pm. We will be honoring our 2018 Citizen of the Year, Linda Quesenberry; Volunteer of the Year, Ed Gelb and Business of the Year, Crizer Construction. Reception starts at 6 pm with a no host bar followed by a buffet dinner catered by Martin’s Restaurant. Presentation of awards begins at 7:30 pm. Thank you to the local businesses and organizations that participated in this years Bear Festival. The community voted for their favorite bear(s) during the Family Fun Fair on September 9th. Winners were Farmers Insurance “Bear in Bee Hive” and Los Osos Valley Memorial Park “Día de los Muertos Bear”. Other participants included: Los Osos CSD, Rotary Club of Los Osos, Lyrics & Melodies Music Studio, Volumes of Pleasure Bookshoppe, and Treasures by Local Artists. The Assessor would like to remind all homeowners, disabled veterans and eligible non-profit organizations that they may file claims for exemptions. The Homeowner’s Exemption exempts up to $7,000 in taxable value of a property if the claim is timely filed or postmarked by February 15, 2018, and up to $5,600 if filed late (postmarked by December 10, 2018). If you received your Homeowner’s Exemption last year, and you still own and occupy the same property this year, you do not need to file again. Your exemption automatically remains in place. The Disabled Veteran’s Exemption is available to exempt taxable value of a property owned by a veteran who is 100% disabled due to service related illness or injury. The exemption may be up to $202,060 if timely filed (postmarked by February 15, 2018) and up to $181,854 if filed late (postmarked by December 10, 2018). To be eligible for either of the above exemptions this year, claimants must have owned and occupied the property as their principal place of residence as of 12:01 a.m. January 1, 2018. Please call the Assessor’s office or visit the website for eligibility requirements and claim forms. Certain non-profit organizations may be eligible for an exemption from property tax if they were using the property for exempt purposes on January 1, 2018. For the full exemption, the organization must have filed or postmarked their claim for Church, Religious or Welfare Exemption by February 15, 2018. Claimants may be eligible for 90% of the exemption if the claim is postmarked by December 31, 2018. The Assessor’s main office is located in Room D-360 of the County Government Center, 1055 Monterey Street, in San Luis Obispo. The telephone number is (805) 781-5643. There is a satellite office in Atascadero at 5955 Capistrano Avenue, Suite B. Information is available on the website at www.slocounty.ca.gov/Assessor. The Kiwanis Club of Bay-Osos is again selling See’s Candies as a fundraiser to support the children in Los Osos and Morro Bay. See’s Candy is a much-appreciated gift for your friends and clients. If you would like to purchase case quantities…and receive a $0.50 discount per box…please place your order NOW. We will deliver your order to you in Los Osos or Morro Bay before Thanksgiving. To place an order, or if you have questions, please call George Janeway at (805) 801-8793. The deadline for placing your order is October 25. The Domino’s Pizza in Los Osos has been locally owned and operated since it was bought by my wife (Brenda) in 1989. Brenda started working at the Lompoc Domino’s in 1983 and was offered to work in the Los Osos Domino’s in 1988. In 1989, the Los Osos location was up for sale and was purchased by Brenda. While I was attending Cal Poly in 1990, I met Brenda and was immediately attracted to the owner of a pizza restaurant ……. I mean my future wife. In 1994, we were married and I moved to live with her in Los Osos. In 1995, we had our first child Brandon and in 1998, our second child Kyle. Domino’s became a true family operation with the kids growing up around the store and eventually working with us and running the store. We have enjoyed running the day to day operations of this business over the last 29 years and look forward to many more years to come in this beautiful community. Are you ready to participate in this years’ 3rd Annual Bear Festival? We are looking for Bears that represent Community Spirit. Big, small, friendly, silly or serious, we invite local businesses, community artists, creative professionals, organizations and students to create something special for locals and visitors to enjoy. All Los Osos BEAR! must be in place by August 8th and displayed until September 8th. BEARS will be moved to the South Bay Community Center on September 9th for Grandparents Day where they will be judged by a panel and the community. There will be categories; Chamber Business, Residential/Organization, Youth (under 18). Cuesta College is further expanding access to higher education with the expansion of the Cuesta College Promise Scholarship to include a second year of fee-free education. San Luis Obispo County high school seniors graduating this year will be the first class eligible to obtain two full years of fee-free education at Cuesta College. “We are very pleased to be able to welcome the class of 2018 and beyond to two years of fee-free college,” said Cuesta College Superintendent/President Dr. Gil Stork. Year two of the Cuesta Promise will include academic performance measures. To earn a second fee-free year, students must complete more than 50 percent of the units attempted, and earn a grade point average of 2.00 or higher during their first year on the Promise. “Our goal is to both remove financial barriers and increase the number of local high school graduates attending and staying at Cuesta College,” said Dr. Stork. The second year of the Promise is made possible by various funding sources. First, by the California College Promise Grant, formerly known as the Board of Governors Fee Waiver (BOG). The California College Promise Grant provides eligible students enrolled at CA community college campuses with free tuition. Major campaign donors include the Harold J. Miossi Charitable Trust, the Estate of Mary Schwartz, the Estate of Laura Coats, Rick and Jill Stollmeyer, PG&E, and Dr. Grace Crittenden. The third funding component is the recent passage of Assembly Bill 19, which has full funding included in CA Governor Jerry Brown’s 2018-2019 proposed budget. AB 19 pays for the tuition of first-time, full-time students. “AB 19 provides enough funding to allow the Foundation’s fundraising efforts to support year two,” said Hill. Since 2013, Cuesta’s local high school graduate attendance rate went from 25 percent to more than 36 percent. Today, 90 percent of local graduates who attend Cuesta College immediately after graduating, come as Promise students. The class of 2017 saw 876 students attend Cuesta on the Promise, including 180 from Paso Robles High School, 130 from Atascadero High School, 123 from Arroyo Grande High School, 101 from San Luis Obispo High School, 80 from Morro Bay High School, 74 from Templeton High School, and 25 from Coast Union High School. Due to a private donation of $20,000, the Cambria Promise Scholarship was launched in the fall of 2016, allowing all graduates of Coast Union High School and Leffingwell High School to receive a fee-free second year at Cuesta College. In order to obtain the Cuesta Promise Scholarship, students graduating this year must enroll in courses for the Fall 2018 semester and complete the steps for the Promise Scholarship by August 1st. Upon completion of the application process, fees will be waived for Fall 2018 and Spring 2019. If a student meets the academic expectations in year one, their fees will be waived again for year two. The Cuesta Promise is the result of a donation of more than $8 million to the Cuesta College Foundation from the Charles and Leeta Dovica Family Trust, who requested the funds be used for scholarships. The scholarship endowment, created in the fall of 2013, currently saves students an average of $1,400 each year by paying for the per-unit cost of classes, health fees, Associated Students of Cuesta College fees, materials fees, Student Center fees, and the Student Rep fee. For questions about the Cuesta Promise Scholarship, call (805) 546-3153 or email promise@cuesta.edu or visit www.cuesta.edu/admissionsaid/cuestapromise/. Founded in 1973, the Cuesta College Foundation connects private and corporate philanthropy with opportunities to support Cuesta College and its students. By doing so, Cuesta College can fulfill its promise to educate the community’s future business leaders, health care workers, teachers, engineers, scientists and first responders. For questions about the Foundation, call (805) 546-3279. CI Destinations along with Los Osos/Baywood Park Chamber of Commerce will be offering a fully escorted tour of the beautiful Amalfi Coast, October 24, 2018. The Amalfi Coast is a captivating combination of great beauty and gripping drama: coastal mountains dotted with picturesque towns and lush forests plunge into the sea. UNESCO had the entire area declared a World Heritage Site in 1997 for its unarguable beauty and uniqueness of its natural landscape. Mountains erupt from the waters of the Mediterranean and pastel-painted buildings cascade down cliffs. This is the Amalfi Coast – a handful of villages that will be the backdrop for your journey. Travel the amazing Amafli coast, taking in the view that inspired countless artists and gain historical perspectives. From your home hotel in Maioriare, visit Positano and Ravello, cross the Gulf of Naples to visit the enchanting Isle of Capri. Take in the archaeological sites of Herculaneum and Pompeii, and the Greek ruins of Paestum. End this amazing experience in Rome as all roads in Italy lead to Rome. $599 – Optional 2 night Rome Post Tour Extension – Includes deluxe motor coach, 2 breakfasts, Rome city tour, and professional tour director. The County of San Luis Obispo Board of Supervisors adopted a $592.3 million budget for fiscal year (FY) 2017-18 on Tuesday. The $592.3 million budget is about a 3 percent growth over the current fiscal year. The budget prioritizes funding that allows the County to meet legal mandates and debt service requirements, strengthen public safety, and improve roads. It also includes funding to manage groundwater basins, continue the 50Now program to house and serve chronically homeless individuals, regulate medical and recreational cannabis, and fund parks projects in the south county. The budget also incorporates funds distributed to local nonprofits as well as funds related to groundwater management, commercial cannabis cultivation regulations and enforcement, and affordable housing programs. “The budget is the most important document we produce, as it outlines the County’s financial plan for the upcoming fiscal year and is intended to communicate and implement Board policy related to County operations,” said County Budget Director Emily Jackson. The people of San Luis Obispo County had an opportunity to weigh in on the budget recommendations during public budget hearings on June 12 and 14. The County government publishes its award-winning budget document every year, attempting to strike an appropriate balance between financial detail and discussion of bigger picture issues, Jackson said. Each year, the document is intended to inform meaningful discussion about resource allocation decisions among the public, the Board of Supervisors, and staff. The Los Osos/Baywood Park Chamber of Commerce will once again be offering a fully escorted tour of the awe inspiring region of Tuscany. Tuscany is the place where movies are filmed and fantasies run wild. Perhaps it’s the cities of Florence, Pisa, or Sienna that invoke feelings of culture, art, or arouse the senses as do the smells and taste of the Chianti region. The fact is that Tuscany is home to some of the most famous tourist attractions in all of Italy. This is truly an amazing opportunity to discover all that Tuscany has to offer. Tuscany is what many people around the world envision as a true representation of Italy. DEPARTING OCTOBER 24, 2017. For more information contact the Chamber office at 805.528.4884. On behalf of the Danville Pittsylvania County Chamber of Commerce, I want to thank you and CI Destinations for an amazing trip to Tuscany earlier this month. We had a group of 23 travelers who went to Tuscany as part of a CI Destinations trip through our Chamber. Every person complimented the outstanding customer service and attention to detail that your company provided. Residents of San Luis Obispo County can now access the County’s 2016 Annual Report online to find information about activities, accomplishments and challenges the County faced last year. The 2016 Annual Report gives people a glimpse at some of the hundreds of public services provided by the County last year. From a behind-the-scenes look at FEMA drills and the Phillips 66 hearings to details about the three elections the County managed last year, the report is full of important information that the public can use and refer back to for years to come. The report can only be found online at www.slocountyannualreport.com. The report this year is broken out into five main sections: water, community, economy, upgrades, and safety. It also includes a video message from District 4 Supervisor Lynn Compton, who served as the 2016 Chair of the Board of Supervisors, and a written message from Buckshi. Existing staff prepared the report in-house, which included coordination between departments, content development, graphic design, website development and video production. The winner of the first annual Festival de Osos (Bear Festival) was Meditating Bliss Bear created by Susan Nazionale, 2180 Del Norte Street. With the help of Baywood Elementary Bearcrows, local businesses and the community there were 22 bears on display throughout Los Osos/Baywood Park. Thank you to American Threadwork/Linda Settevendemie for the cute embroidered bear prize. Looking forward to more bears next year. The Los Osos/Baywood Park Chamber of Commerce presented Aracely Aceves Lozano of the Food Bank Coalition with a donation of $400 raised at the Annual Festival of Flavor Food Showcase held on June 25, 2016. This community friendly event was held at the South Bay Community Center and chaired by Chamber board members Chad Carroll of Baywood Ale House and Gene Heyer of Thoma Engineering. This donation was made possible by the participation of our food and beverage sponsors Beach Hut Deli, ‪Nichols Pizza N Grill, Baywood Ale House, Kuma Bowls Sushi, Sylvester’s Burgers, Nardonne’s Pizzeria, ‪Sweet Alexis Bakery, ‪Blue Sky Bistro on the Bay and Baker & Brain Wine. The donation will provide $4,000 worth of nutritious food to individuals and families who face hunger. 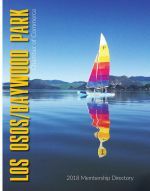 Los Osos and Morro Bay both ranked in a listing of the top 20 beach town housing markets in the nation compiled by RealtyTrac. The rankings were based on home values, weather, air quality and crime rates. The two were the highest-ranked California communities in the tally. Los Osos ranked sixth with a public safety grade of A, a median home price of $418,403, an average temperature of 60 with sunny days 78 percent of the time, and good air quality days 100 percent of the time. Morro Bay ranked 11th, with identical weather, crime and air quality numbers but a higher median home price of $537,479. The median is the midpoint at which half of the houses sold for more and half for less. Figures are compared year-over-year because of the seasonal nature of home sales. The top-20 U.S. beach communities ranked by RealtyTrac, a resource for comprehensive housing data, were all from California, Florida or Hawaii. Hobe Sound, Fla., was ranked highest in the report published in May. The other California communities to make the list were Dana Point at No. 16, Seal Beach at No. 17, and San Clemente at No. 19. Each of the top-20 beach towns had median home prices below $1 million and average daily temperatures either in the 60s or 70s. After a long and complicated restoration process, the iconic Los Osos Bear Signs have been completed and reinstalled on Los Osos Valley Road and South Bay Boulevard, and they are beautiful! We are sure you’ve seen them by now because they went up three weeks ago. Unfortunately, both Pandora and I were in the process of leaving town on the day of the reinstallation, but Pandora managed to take some pictures and send them to the Bay News. A heartfelt thanks to all of you who helped in the restoration process, and kudos to muralist Rebecca McFarland, who recreated the artwork beautifully, and professional signmaker Sean Beauchamp, who completed the process and reinstalled the signs. Gary Dove, with support from his Rotary cohorts, will reinstall the solar lights on LOVR. Here are a few of Pandora’s pictures of Sean and his crew during the installation process. Go to our website to see more pictures: wwwcelebratelososos.org.